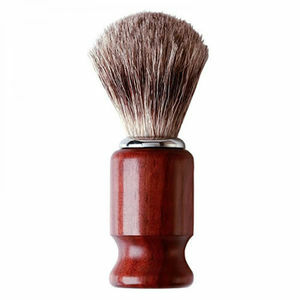 Traditionally-styled shaving brush with modern benefits. The Dark Stag Shaving Brush is made from modern synthetic badger bristle, which means that the bristles are secure and do not shed over time. The bristles are designed to stimulate and lift beard hair making it perfectly prepared for closer shaves. The bristles are non-absorbent and so allow the brush to dry quickly. They are made up of a combination of straight and waves bristles, allowing the brush to quickly whip up a rich lather. A robust pre-shaving cleansing cream that contains extracts of the natural cleansers Tea Tree and Eucalyptus. Comes in a 90-ml bottle. A cleansing shaving soap that contains natural extracts of Tea Tree and Eucalyptus to produce a rich, creamy lather that reduces razor burn and irritation. Comes in a 200-g cake. Formulated with moisturising seaweed and cucumber and soothing witch hazel and tea tree to help close pores and calm the skin after shaving. Comes in a 100-gram tin. Gentle, soothing aftershave balm that contains natural extracts of tea tree and cucumber combined with witch hazel and oakmoss to hydrate and replenish. Refreshing and soothing toning spray that contains natural extracts of tea tree and eucalyptus combined with witch hazel and oakmoss to soothe and cleanse. Comes in a 100-ml spray.